Joseph Reed was born in Trenton, New Jersey, the son of Theodosia Bowes and Andrew Reed, a merchant and minor officeholder. While the family lived briefly in Philadelphia, young Reed was enrolled in Francis Alison‘s class at the Academy of Philadelphia. However, after the family returned to Trenton, he attended the College of New Jersey (Princeton), graduating in 1757. Reed then studied law in Princeton under the direction of Richard Stockton. After his admission to the New Jersey bar in 1763, he traveled to London for further legal studies at the Middle Temple. Upon his return to the colonies in 1765, Reed was faced with the bankruptcy of his father and the need to support his family. He began the practice of law in Huntingdon County; two years later he was named deputy secretary of New Jersey and clerk of the council and also became assistant to Dennys De Berdt, the former London agent for his father’s firm and now colonial agent for Massachusetts. In 1770 Reed made another trip to England in 1770 to marry De Berdt’s daughter, Esther, whom he had met during his earlier stay in England. Reed and his wife settled in Philadelphia. A decade later, he had become a leading lawyer, a land speculator, the father of four children, the owner of two slaves, and a member of the American Philosophical Society. 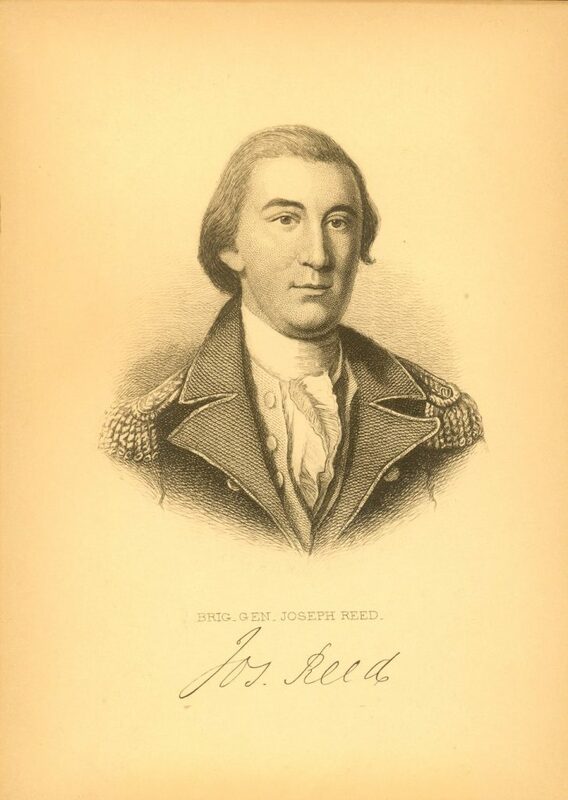 During the American Revolution, Reed served on Philadelphia’s Committee of Correspondence in 1774, as president of Pennsylvania’s second Provincial Congress in 1775, and as a member of the Pennsylvania Assembly in 1776. In the Continental Army Reed became secretary to Commander-in-Chief George Washington and then the army’s adjutant general, eventually rising to the rank of colonel. He saw service at the battles of Long Island, Trenton, Princeton, Brandywine, Germantown, and Monmouth. In 1777 he rejected an offer to serve as chief justice of Pennsylvania, but briefly served in Congress, signing the Articles of Confederation for Pennsylvania during his term. A political moderate, Reed’s beliefs fell between those of fiery radicals responsible for the state’s unicameral constitution and those of the anti-democratic republicans who, Reed felt, were too quick to welcome former Loyalists to their ranks. In 1778 Reed agreed to assist the Pennsylvania Assembly in the prosecution of treason cases. Later that year, Reed proved to be a good compromise candidate, was elected president of the state’s Supreme Executive Council (the equivalent of governor). During his tenure, Reed was unhappy with both the radicals’ use of mob action and also the Republicans’ apparent preference for bringing down state government over defeating the British. As governor, he worked to moderate extremes on both sides and to bring about conciliation. As governor from 1778 to 1781, Reed served in an ex-officio capacity as a a member and as president of the board of trustees of the University of the State of Pennsylvania (now the University of Pennsylvania). After his term as governor, Reed continued as an elected trustee until his death four years later. After he stepped down as governor in 1781, Reed was one of the lawyers who successfully defended Pennsylvania’s claims on the Wyoming Valley against a challenge from Connecticut. He also defended himself in a bitter public dispute with John Cadwalader over a charge, largely disproved, that Reed had contemplated abandoning the Revolution in 1776. Reed was elected to a congressional seat in 1784, but he was in poor health and declined to serve. He died the following year.